Summary: Karyn M. Erickson, P.E., directed and managed all planning, design, acquisition of State DCMs, permits, engineering and contract documents to construct a 410 ft long sand-filled geotextile container revetment for the protection of the Shell Island Resort. The project provided short-term interim shoreline stabilization of Mason Inlet, a rapidly migrating inlet, until the long-term Mason Inlet Relocation Project could be constructed. 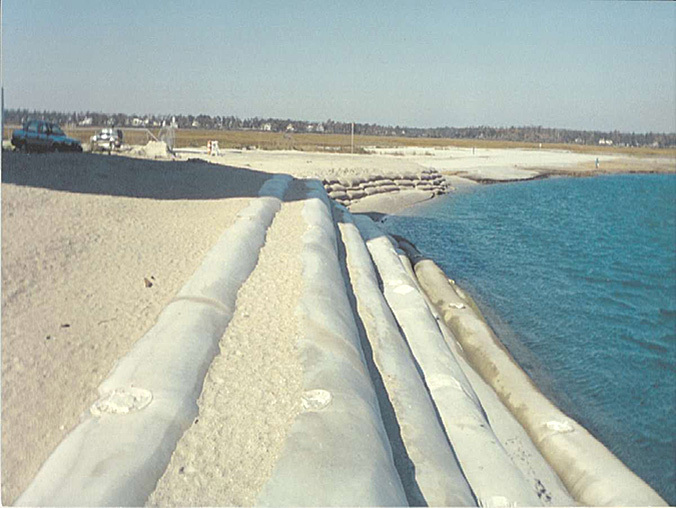 The North Division of Coastal Management issued a variance in January 1997 to allow construction of this temporary revetment for a period of five years with the performance of semi-annual beach profile surveys and engineering evaluations of the project’s impacts on adjacent shorelines and beaches. This structure performed as designed with no damage following a number of severe hurricanes that occurred between 1997 and 2001. After the revetment was constructed, Ms. Erickson coordinated all beach and upland surveys and aerial photography, prepared Monitoring Reports for NC DCM, and coordinated with the Mason Inlet Preservation Group (MIPG). Working closely with the MIPG, Ms. Erickson assisted in the project’s initial feasibility studies, performed economic studies, produced a financing plan, and provided engineering services to New Hanover County on behalf of their efforts to sponsor the large-scale Mason Inlet Relocation Project.